In 1917, the Blessed Virgin Mary — the Mother of Jesus Christ and Mother of us all — appeared to three shepherd children from the village of Fatima, Portugal six times between May 13 and October 13. She had been sent by God with a very special message for every man, woman, and child on earth. The heavenly Lady explained to the children that war is a punishment for sin and warned that if men did not amend their lives, then God would further punish the world for its disobedience to His Will by means of war, famine, and persecution the likes of which had never been seen before on the face of the earth. But Our Lady’s message was not without hope. On the contrary, Her message is full of hope… our only hope. For She promised that Heaven would grant peace to the entire world if Her specific requests for prayer, penance and consecration were obeyed. No more will mothers and fathers or sisters and brothers die in senseless wars. War will be a thing of the past. Governments will not only cease to wage war on other nations, but will also cease waging war on their own countries and people, including the unborn. Cities and towns will know peace and security, no longer troubled by crime, drugs, and senseless violence. And for each of us, it means an end to hatred and division in our own families. No longer will families be torn apart by divorce, drugs, violence, or financial distress. The peace that only Jesus Christ can give will reign over the entire earth! So how do we know that this peace not only can happen, but will happen? Because we have the promise of Our Lady! The same Lady who predicted the end of World War I and the beginning of World War II. The same Lady who foretold the early deaths of the two younger seers, Francisco and Jacinta Marto. The same Lady who predicted the name of the next pope — Pius XI. The same Lady who promised the world a time of peace if Her message was obeyed. To confirm all that She had said and to prove that it was indeed the Mother of God who was appearing, God performed what has become known as “The Miracle of the Sun” on October 13, 1917. It was witnessed by over 70,000 people who had gathered to see the miracle first-hand as well as by numerous others from the surrounding towns and villages. The Fatima Center is a grassroots association of Catholic priests and lay people — the type specifically permitted by the Code of Canon Law — formed in 1978 in response to Our Lady of Fatima’s message of hope and warning to mankind. 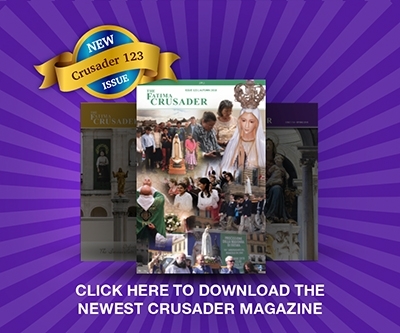 The founder and International Director was Father Nicholas Gruner, who for 37 dedicated years dedicated his life to promoting interest in, knowledge of, and obedience to the full Message of Our Lady of Fatima. On May 13, 1967, while he was in Fatima, Pope Paul VI specially blessed 25 Pilgrim Statues of Our Lady of Fatima, which were to travel from place to place in order to remind the faithful about the Fatima Message. One of these statues has been entrusted for the last 34 years to Father Gruner and this apostolate to promote the full Fatima Message. The Fatima Center is blessed and honored to be the custodian of this Pilgrim Statue which makes its way throughout the world, wherever the statue is invited. The statue visits have become the occasion of many spiritual and temporal blessings given through Our Heavenly Mother’s intercession. In this way, many people get to know about our only hope for peace — Our Lady of Fatima’s Peace Plan from Heaven.